Here's a mild-mannered guy with super-hero potential: an unassuming individual of shy opulence with a keen willingness to share nonetheless. No heart on his sleeve; nothing up his sleeve, for that matter. You might mistake him for a doctor, a lawyer, an Indian chief: anything but a musician. You probably wouldn't expect to read about such a casual cucumber. Tommy Gravino comes on cool. Tommy Gravino waxes nonchalant. Tommy Gravino soars below radar, where he's seen a thing or two. It's the bluesy be-bop from his sax, an ethereal lilt from his flute, the raking of his fingers across the 88s, either way you're gonna dig Tommy Gravino. On a recent sun-baked Park Ave. afternoon you might've been lucky enough to see Gravino breeze by in a shiny red convertible piloted by a pretty blonde. With his long mane waving behind him, an easy-going smile spread across his face, there was a man clearly loving life. 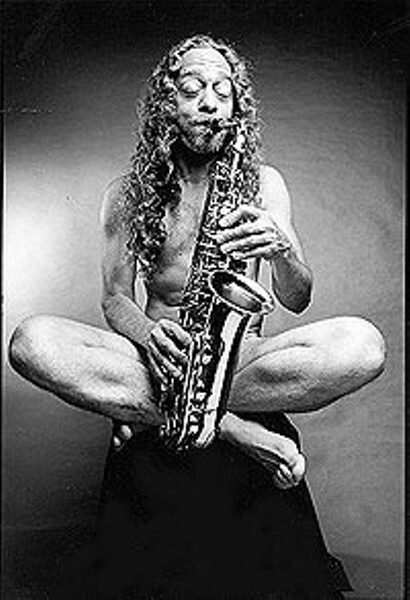 Gravino blows hell from his saxophone: a syncopated swagger with one breath, and a rusty, mournful cry the next. A stoic stage presence belies the wealth of music in his soul. Though gigging steadily for years as a professional musician, the big break seems one step beyond. "You always hope to break into something, or luck into something," he said recently. "It's just been eluding me." OK, so he hasn't sold his soul to record label big-wigs or bumped rails with Bono, but the cat's been around. And he's damned good. This rather quiet man clearly loves all music and is essentially a chameleon, floating effortlessly through jazz, rock, blues, new-age, you name it. Getting him to describe it, however, is like pulling teeth. It's not that he thinks it's unimportant, it's just that his passion moves almost exclusively through his music. "I love all types of music," he says, his eyes widening. "But my absolute favorite is funky." His proficiency on a number of instruments and his ability to write and arrange make him the Rochester musician's numero uno go-to guy. Whether jamming with G. E. Smith, Trini Lopez, or the Coupe de Villes, Gravino takes on each group or artist's aesthetic. He cops their attitude. He plays their music, making it his own. Gravino grew up in East Irondequoit and began playing the sax by age eight. At 16, he got a scholarship to New Mexico State University. "It was a culture shock out there, man, whoa!" he says. "They didn't even do blues. It was all acid rock or country at the time. It was tough to get a gig." Gravino also studied music at SUNY Brockport, Empire State College, and the Eastman School Of Music. "Four schools, no degrees," he laughs. The Holiday Inn circuit was big at the time, and Gravino wound up criss-crossing the country "doin' disco six nights a week" before moving to LA in 1976. "I hooked up with a cat named Chick Willis, who played guitar and sang," he says. Chick's brother, Chuck, was an r & b sensation from Atlanta known for penning the classic, "C.C. Rider." "We toured in a motor home with a trailer," Gravino says. Willis was ex-military, so the duo played military bases "anywhere in a big circle between San Francisco and Okalahoma." In between the G.I. gigs for Uncle Sam, they'd pick up some colorful side work. "We'd park in these low-income housing areas," he says. "Welfare homes that were barely a step up from trailer parks. You'd bring your own booze and they'd provide set-ups." A particular bar at one of these redneck Rivieras remains forever pungent on Gravino's mind. "It was so bad, it had chicken wire in front of the stage," he says. "The bathroom was a sink at knee-level with a hose going out the back. We didn't do that for too long." While still gigging with various bands around LA in 1979, a Chinese agent hooked Gravino up with a slick gig playing sax for Morris Bates, a Native-American Elvis impersonator in Las Vegas. "I was taking a dump just before the [first] show," Gravino says, "when all of a sudden I see high heels in the stall next to me standing, facing the toilet. What a trip, man!" The King had only been dead two years, and the impact and importance of impersonators was yet to be fully realized, exploited, or played-out. The Elvis impersonator and a troupe of female impersonators shared dressing rooms and, apparently, bathrooms. The King and the queens alternated acts every night at the legendary Silver Slipper on the old sin-city strip. "That gig lasted about three years," he says. Bates took the group to South Africa, where they were unable to bring a black singer from the group. "Apartheid was still happening, even though the black-white ratio was something like six to one," he says. "In fact, Mandela was still in jail." Gravino was there for a month playing to large auditoriums of whites and witnessing local flavor --- including a knife fight in Soweto --- with an Indian tour guide. The early '80s found Gravino back east, living and playing in Binghamton before moving back to Rochester. He joined TCB (the Elvis irony continued) with Ronnie Alberts (Wilmer & The Dukes) and Kate Silverman. Gravino worked with countless touring and local acts. Happy as a sideman, he continued to write, despite the difficulty in finding willing sidemen of his own. He self-released A Flute's Dream, an album of eastern-type new age music. Gravino says the album proved to be popular as relaxing background music for massage therapists. Today, Gravino keeps busy adding his fingerprints and soul to bands through writing, arranging, and playing. He is willing to sit in with just about anybody in need of a little soulful honk 'n' wail from his saxamaphone. He regularly plays with the incomparable flamenco guitarist, Jack Edward Smith, and plays as a one-man act throughout the city, performing covers and originals, playing all the instruments with confident ease. Gravino was recently awarded honorable mention in the "Mild 2 Wild Best Song, Best Lyrics" contest in Ft. Myers, for his song, "Down In Nashville." His new album, the aptly titled Party Of One, will be out in November, featuring eight of his new compositions. Gravino can be caught all over town. He keeps on keepin' on. "I don't know, man," he shrugs, smiling. "I love getting out and having a good time. I still love to play live."